The Rock Band warehouses must be bursting with Special Edition sized boxes, because MTV Games is practically giving away the game and its sequel for a song. 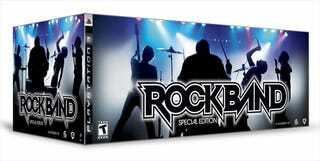 The official Rock Band web site is selling the Rock Band Special Edition Bundle, including the game, drums, microphone and guitar, plus a copy of Rock Band 2 for a combined $79 USD. That's shipped. Shipped! Obviously, you're getting first gen instrument controllers, but you're also getting 140 songs for under 80 bucks. The deal is limited to the PlayStation 3 and Xbox 360 versions of the game, better known as the ones you should be getting anyway.